Storàge is a new art form for our times in which artists will prevent at all costs, their work from seeing the light of day. Artists must conceal what they do, make sure no one finds out that they are brilliant. If an artist must show someone something they have created, they should show another artist so as not to upset the art markets. Other artists do not really count as human beings so there really is no harm in telling them. That is how art continues to thrive. Artists are sequestered from the rest of humanity. But one should proceed with caution because occasionally artists know actual people and the news of what kind of work the artists are producing must not spread to civilians. Storàge is an art form like many others: collàge, assemblàge, frottàge. The accent is on the second syllable. The emphasis is on the storing of important information and objects–preferably one of a kind objects, although the storing of multiples is also encouraged–until a great deal of time has passed and the ideas and images contained therein, hidden from public view, have been discovered and explored by other, less talented individuals. This is bound to happen while the work is rotting under lock and key, no matter how advanced the work. 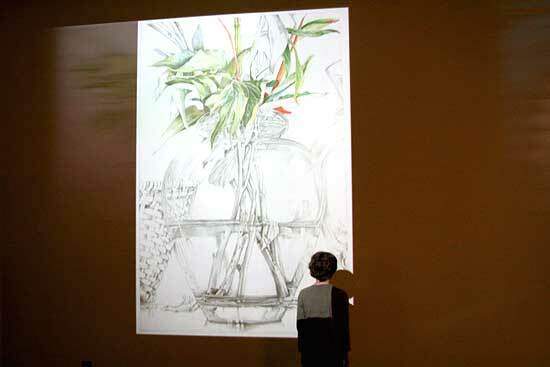 Even the most vanguard artist will be unable to stave off the advancing future which will soon provide the unique conditions necessary for the artist’s work to be removed from Storàge without consequence. Once a work of art has been rendered culturally feckless, Storàge is no longer necessary. The work can now be trotted out into the marketplace where it will no doubt have to endure other types of packaging, wrapping and covering which are part of the Storàge process when enacted by a Storàgist but in these new contexts the accent in Storàge is removed and it becomes simply storage in which excessive packaging and hygienic germ free protection is always considered good for business. Of course any work of art or other consumer item, no matter how processed and “valuable,” always remains in danger of being placed on dusty shelves in the forgotten back rooms of galleries or museums by art professionals. This is where the nuances of Storàge and storage are revealed–for it is these very art professionals who are uniquely qualified to determine whether or not an artist’s work is any good. During the interim period when the artists are left trying to make this crucial decision for themselves, their work must be safely hidden from view while these art professionals are courted at the artist’s expense without causing too much of a fuss, for it is the artist’s passion that must also remain in the limbo of Storàge, not just their output. Sometimes fear of the art professionals will cause an insecure artist, one prone to alarmism and in constant dread of being accused of being labeled an exhibitionist, to send works into hiding early, thus risking beginning their career as a Storàge Artist prematurely. But there is nothing to be alarmed about here. Fears about these types of fear are only a waste of time. Any uncertainty at all must always be acted on immediately. To err on the side of invisibility is never a mistake. If an artist has any doubts at all about the worthiness of what has been created, they should simply place the work in a secure area, free from intellectually curious intruders where no one can see it. In fact experience has shown that no work is too ripe to entertain misgivings about its readiness for public consumption. Any suspicions at all should be indulged whole-heartedly and enthusiastically by the Storàge Artist. The Art of Storage was recently seen as part of Mark Bloch’s one man show “Secrets of the Ancient 20th Century Gamers” at Emily Harvey Foundation in NYC March 18 through April 2. February 20th was an auspicious date for the arts community! 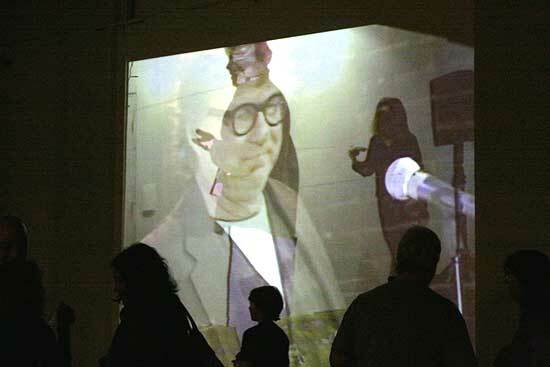 That Saturday night, was the first of three parties to benefit Artist Organized Art in which A.O.A. 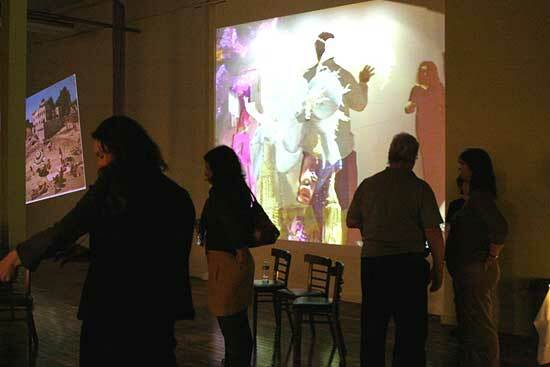 threw a community outreach event, arts network builder, exhibition, performance…did I forget to say fundraiser? 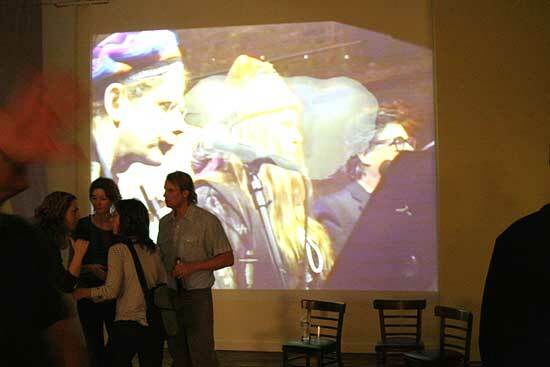 The event featured large projected images by local artists of the Pioneer Valley in Massachusetts and hard and soft indie music by Katyland along with some great cover songs, a regional progressive music favorite. 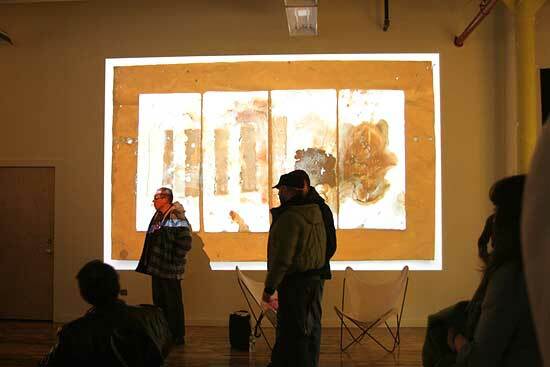 Denis Luzuriaga, a painter and video artist, compiled the projected images: in the dead of winter the crowd was treated to a colorful array of visual artworks, documents and pleasantly dated black and white photos of beach scenes. 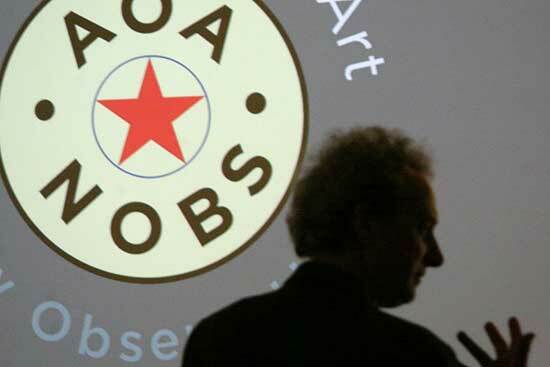 Each element of the event reflected a key component of the AOA mission to support creative independence in the form of self-supporting and self-generating exhibitions through artist organized media, events and cultural education. 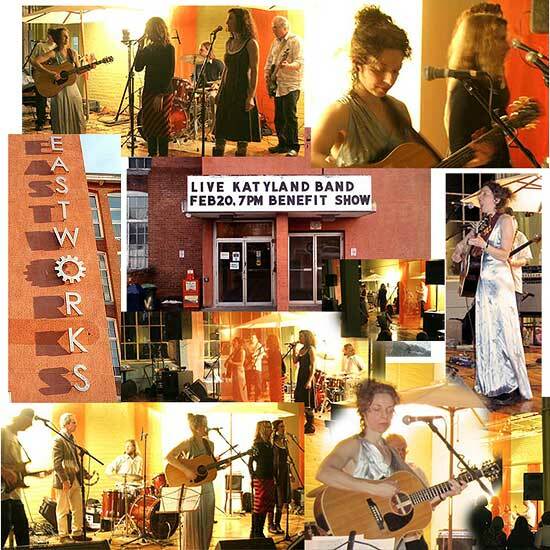 The festivities took place at Eastworks a converted warehouse on the river at 116 Pleasant Street in Easthampton. 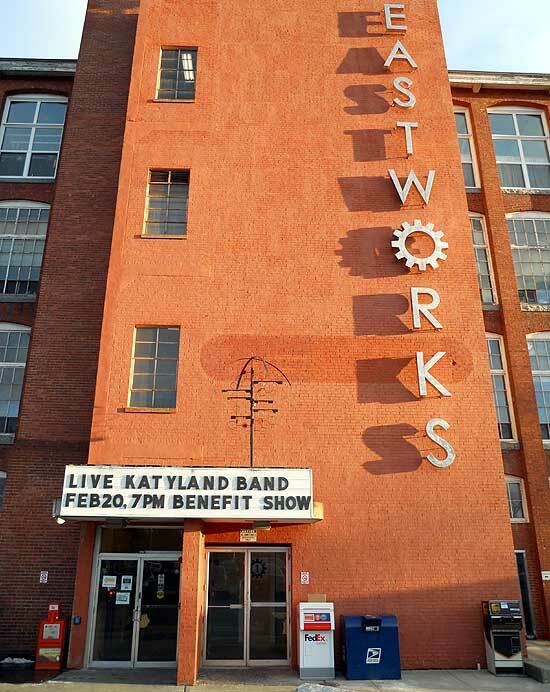 Artists of all kinds and their allies came from neighboring towns as well as the studio and residential community of Eastworks, a loft building community founded by Will Bundy. 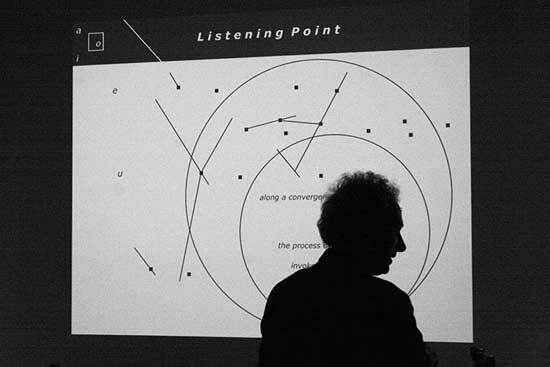 The social and experimental quality of the event recalled important artist communities associated with the avant-garde: Black Mountain College during the 1940s and 1950s, the Village and SoHo in the 1960s and 1970s, and California in the 1970s and 1980s. Why not Massachusetts as an internet hub brought together by AOA in the 2010s? The event represents a significant group effort organized by artists: Susannah Auferoth, Jessica Higgins, Erika Knerr (also representing New Observations, the seminal New York arts magazine that was recently acquired by AOA), Denis Luzuriaga and Joshua Selman. 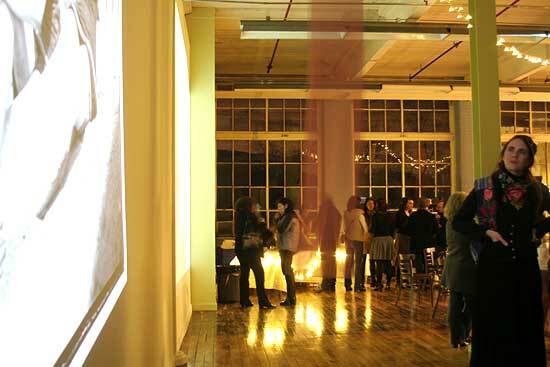 Artist Organized Art is working to improve the quality of life through community culture. The event isn’t over yet. If you were there and have pictures of the event, send them in to be a part of the record! If the event sounds like fun and you’re bummed you missed it, keep your eyes out for more. AOA is ever eventful. The success of A.O.A. comes from community support (cultural, logistical and financial), which means everyone is invited to be apart of it, enriching our world by organizing its culture as artists. Benefit parties for Stage Two and Stage Three will be forthcoming. If you’d like to contribute to Artist Organized Art visit: http://giveback.artistorganizedart.org Or print out the form below and mail it to us with your kind donation.